December 2, 2012 April 29, 2013 elskenewman9 Comments on Someone swapped our baby! They haven’t really, although it did feel like it last weekend. We have been to Holland for a few days to celebrate my aunty and uncle’s 45th wedding anmiversary (45! Wow! That is awesome isn’t it?). It was an absolutely amazing weekend. We started off on the ferry for 7 hours, Elisabeth had great fun in the play area where she was playing Captain Elisabeth at a big steering wheel and generally running around and telling us where to sit and stand. It wasn’t hard to entertain her as we let her have unlimited ipad time, which she loved! All in all she was really well behaved and even had a little nap on my shoulder for half an hour. When we got to my sister’s she was a bit tired and scared of Valentijn (her 3 and a half year old cousin), but she settled in really quickly and before we knew it she was happily playing. Valentijn was kind enough to give up his room so Elisabeth could sleep there. He would sleep in my sister’s room, he was obviously excited about sleeping in mummy and daddy’s room. We were both quite worried about the sleeping arrangements because the last time we went away sleeping was an absolute nightmare, we were awake for nights on end and we really weren’t looking forward to doing that again. But to our shock she slept through! And not just the first night, but all three of them! It was just wonderful, we have been a bit reluctant to go anywhere with her because of the sleep problems, but now I feel like we can finally start seeing my family more regularly, which is great news. The party on Saturday was brilliant, not only did I get to see lots of my lovely family who I hadn’t seen in years, but my husband and Elisabeth also had their first proper Sinterklaas experience. 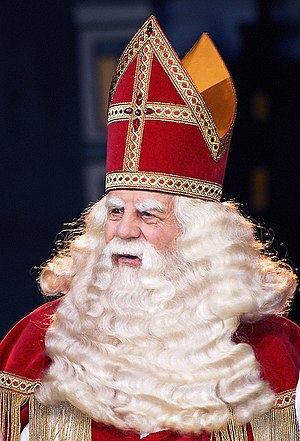 For those of you who don’t know about Sinterklaas I will post some pictures when I get a chance. Elisabeth was really well behaved and it was awesome to finally be able to introduce her to her Dutch family 🙂 All in all a great weekend and lots of hope for restful nights on trips to come (we’re already planning one to Germany next year to see my dad.) Happy days! I guess Elizabeth is a future traveler. Glad the trip was such a delight. It sounds like she’s starting to grow out of the baby sleeping troubles which is fantastic! I think you have a whole new set of adventures with your tiny person and these are going to be the good kind (not the I-don’t-care-what-my-outfit-looks-like-I’m just-happy-I-got-3-hours-of-sleep kind). You’re right, things are definitely changing now we all sleep. I even considered having a hair cut the other day 🙂 Can’t wait to see what she’ll throw at me next though. Thanks, yes everything seemed to change after she feel asleep on the sofa for the first time a couple of months ago, as if she is all of a sudden happy to give in to sleep.